Looking for a Used F-150 in your area? CarGurus has 222,283 nationwide F-150 listings starting at $1,400. 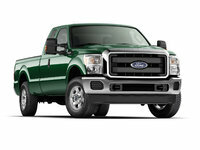 Again setting the standard for what a pickup truck should be, the 2014 Ford F-150 half-ton full-size workhorse ought to be in dealer showrooms in late 2013. This perennial leader in its field… not to mention on the job site and carving up snow-covered parking lots… is expected to boast a few minor cosmetic and interior accent tweaks, but the biggest change for the all-but-inherent class leader is the introduction of the brand-new F-150 Tremor sport version. The first of the regular-cab F-150s to carry the well-wrought 3.5-liter EcoBoost twin-turbo V6 as its standard powerplant, look for this newest half-ton to be equipped similarly to the FX trim level, appearance- and comfort-wise. And speaking of trim levels, there are now 11, including the Tremor. In ascending order of expansiveness (and expensive-ness) are the base XL, the SXT, the XLT, the new Tremor and the FX2, then continuing with the entry-level-luxury Lariat and the up-featured FX4, on to the off-road-dedicated SVT Raptor, the full-out-luxurious King Ranch, and the richly appointed Platinum, ending up with the ultra-posh Limited. Once more, this big rig comes delivered with standard rear-wheel drive (RWD) while able to be fitted with available part-time 4-wheel drive (4WD). Thus, customization possibilities for this hefty hauler remain pretty much unlimited. 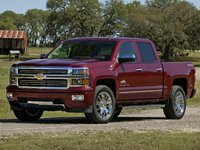 Of course, 3 cab configurations—the 2-door regular cab, the SuperCab (extended cab) with reverse-opening rear doors and the SuperCrew (crew cab) with 4 independently opening doors—will return for 2014, with regular-cab versions offering seating for 3 with the SuperCab and SuperCrew seating 5 or 6, depending on features. Again maintaining tradition, this bad boy should offer an 8-foot bed, available on regular and SuperCab versions, a standard-size 6.6-foot bed, available to all three cab configurations, and a 5.5-foot bed that can adorn SuperCab editions. The 4 engine choices in the 2014 F-150 stable again start with the base 302-hp 3.7-liter Flex Fuel (FFV) variable-valve-timed (VVT) V6 engine and mosey on up to the V8-burying 365-hp 3.5-liter turbocharged V6 (standard in the new Tremor sport truck), then to the capable FFV 360-hp 5.0-liter V8 and wind up with a 411-hp 6.2-liter V8 powerplant. All engines mate with the standard 6-speed automatic transmission to put out 278, 420, 380 and 420 lb-ft of torque, respectively, with mileage estimates running from an average 19 mpg in the normally aspirated V6 down to an average 15 mpg from the 6.2-liter V8. Max towing, with the proper equipment, is some 11,300 pounds with the bigger V8, while even the normally aspirated 3.7-liter V6 can haul 6,700 pounds when equipped with an available heavy-duty tow package. The available 4WD system includes a locking rear differential, auto-locking hubs and a 2-speed transfer case. Meantime Ford last year introduced an automatic mode for its 4WD that works similarly to a full-time all-wheel-drive (AWD) configuration with added torque automatically sent to the front wheels for added traction in nasty weather or tacky terrain. Appearance and cabin features reflect the trim level chosen and remain pretty Spartan for the base XL, with 17-inch steel wheels, vinyl upholstery, tilt-wheel steering, air conditioning and an AM/FM stereo, while the top-shelf Limited trim level boasts 22-inch alloy wheels, leather upholstery, heated power-adjustable front seats, memory for driver's settings, Sony premium audio, a power sunroof and hard-drive-based navigation. In between lie trim-specific items like a remote garage door opener, front and rear parking sensors, a rear-view camera and power-folding heated outside mirrors. Oh, and all trim levels except the XL are equipped with at least the basic version of Ford’s popular Sync/Bluetooth hands-free infotainment system, with higher trim levels getting Sync with MyFord and MyFord Touch apps that include dashboard-mounted LCD color touchscreen displays with the navigation system. The SVT Raptor, additionally, deletes some touchy-feely stuff in favor of a dedicated off-road suspension, all-terrain tires and added skid plates, while dispensing with the auto 4WD mode in favor of rugged part-time shift-on-the-fly 4-wheeling that flaunts electronic hi-lo gear selection. Options again include Ford’s touted Work Solutions systems with dashboard-mounted computers and tool-tracking technology, as well as available heavy-duty towing and payload packages, cargo management systems, a spray-in bedliner and rear-seat DVD entertainment. As is traditional, all the above extra goodies are dependent on the trim level selected, with lower trim levels eligible for optional goodies that are standard in more expensive trim editions. Finally, standard safety equipment of note for the entire 2014 F-150 lineup includes 4-wheel antilock brakes, traction and stability control, front side-mounted airbags and front head airbags, with 5/6-passenger SuperCab and SuperCrew variants boasting rear head airbags as well. Additionally, all trim levels sport a post-collision safety system, with all but the base XL delivered with Ford’s conscientious MyKey programmable speed and audio limits for those times the youngsters want to borrow the family pickup for… well, whatever reason. Again this year, the XLT and above trim levels boast standard Sync emergency alerts and communication assistance, the FX trims and higher flaunt a standard remote antitheft alarm, the Lariat and higher editions carry standard turn-signal-integrated mirrors, and the Platinum trim level comes with standard high-intensity-discharge (HID) headlights. Lastly, the SVT Raptor can be equipped with an available front- and rear-view camera setup for an added heads-up in the bush or on the mountain. 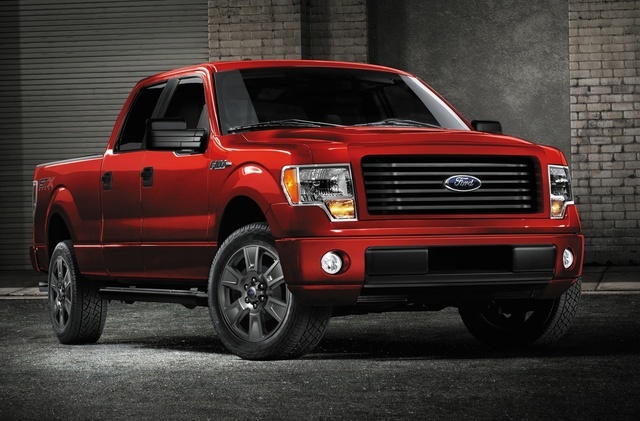 What's your take on the 2014 Ford F-150? Users ranked 2014 Ford F-150 against other cars which they drove/owned. Each ranking was based on 9 categories. Here is the summary of top rankings. 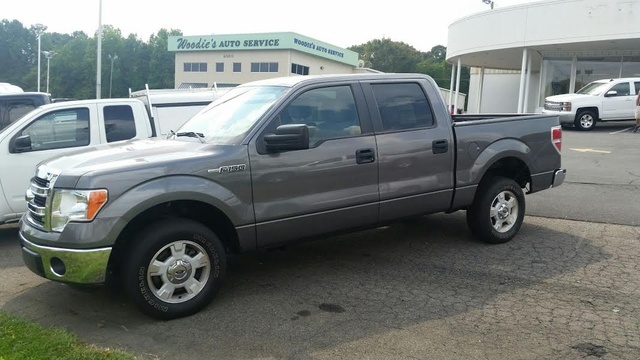 Have you driven a 2014 Ford F-150? 2014 F150 Will Crank But Won't Start? CAN YOU FIND A F150 EXTENDED CAB LIFTED 4 DOOR UNER 20,000?